The Affordable Care Act has drawn mixed reviews from the U.S. public since it became law in 2010, and a new Pew Research Center survey finds that Americans remain split in their opinions about the law and its future. 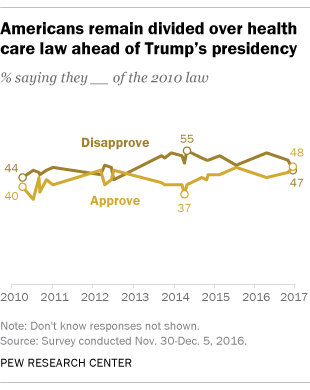 But while President-elect Donald Trump has vowed to repeal the health care law, individual provisions are broadly popular, even across partisan lines. Overall, Americans are evenly divided in their views of the ACA: 48% approve of it while 47% disapprove, according to the survey, conducted Nov. 30 to Dec. 5. Views of the law remain largely divided by party, as they have been since 2009, even before the law was enacted. Today about three-quarters (73%) of Democrats approve of the law, while 85% of Republicans disapprove. Independents are roughly as likely to approve (52%) as disapprove (45%), though independent views of the law have grown more positive in the wake of the election. Americans are also split over what Congress should do with the law next. 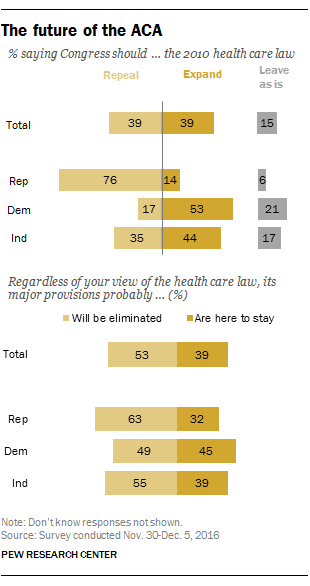 Overall, 39% say the law should be repealed, while as many (also 39%) say it should be expanded. Just 15% say it should be left as-is. Not surprisingly, Democrats and Republicans also disagree on this question: About half of Democrats (53%) say Congress should expand it, while 76% of Republicans would like to see it repealed. Regardless of what they would like to see happen with the law, a growing share of Americans – across partisan lines – now see a dim future for the law’s major provisions. Roughly half of U.S. adults (53%) expect that its major provisions will probably be eliminated, while 39% say they are probably here to stay. About six-in-ten Republicans (63%) predict the ACA’s major provisions will be eliminated, while about a third (32%) expect them to stay. Democrats are more divided, however: 45% say major provisions are likely to stay, while a similar share (49%) expects they will be eliminated. Trump repeatedly criticized the health care law throughout his presidential campaign, vowing to repeal what he called “terrible legislation” and replace it (though he has more recently kept the door open to retaining several provisions). And his recent selection of Rep. Tom Price, an outspoken ACA opponent, as his secretary of health and human services suggests Trump intends to follow through on his pledge. Yet a new Kaiser Family Foundation survey shows that Americans are supportive of several specific provisions of the law, despite their broader ambivalence. An overwhelming majority of Democrats (90%) and Republicans (82%), for example, have favorable views of allowing young adults to stay on their parents’ insurance until age 26. Similarly, 89% of Democrats and 77% of Republicans like that the law eliminates out-of-pocket costs for many preventative services. 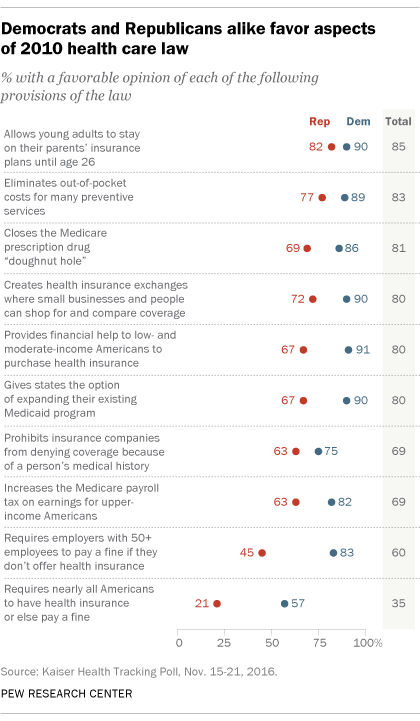 A majority of Democrats (75%) and Republicans (63%) also have favorable attitudes on the law’s stipulation that insurance companies cannot deny coverage based on pre-existing conditions or medical history. But partisans are more divided over some of the law’s other provisions. In particular, Republicans have far less favorable views than Democrats of the fines the law imposes for not meeting specific requirements. For example, while 83% of Democrats have a favorable opinion of requiring employers with 50 or more employees to provide health insurance or risk a fine, that compares with just 45% of Republicans. A similar partisan gap is evident over the least popular provision of the ACA, its requirement that nearly all Americans should have health insurance or risk being fined: 57% of Democrats have a favorable opinion of this, compared with 30% of independents and just 21% of Republicans. For the first time, more Americans say 2010 health care law has had a positive than negative impact on U.S.